For many years now I have delayed putting on the composite attachments for Invisalign until one week into care as a way to give patients a chance to settle in, get used to the trays and begin some initial tooth movement. My blog post about this approach prompted my good friend Dr. Nancy Ward to reach out with some suggestions on how to incorporate it into the new Invisalign Protocols. Nancy focused her private practice on GP ortho, and co-teaches a course on Invisalign at The Pankey Institute with Dr. Brian Gray. The new protocol is to change aligners every week. I follow this for mild to moderately crowded cases and all refinements. 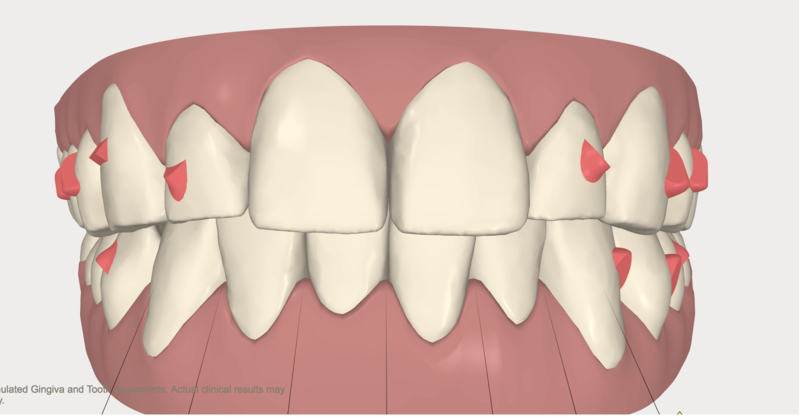 I even follow the new protocol of having patients change aligners every week for posterior intrusion cases designed to solve an anterior open bite. When ordering the case you can request for the attachment aligner to coincide with aligner 2. This way the patient doesn’t have to wear the first aligner for more then a week. If you want them to wear each of the aligners for 2 weeks you can still request to have the attachment aligner made for aligner 2. When I started treating with Invisalign I put the attachments on aligner 2 following this protocol for the very same reasons you suggested. The attachments were very large and made it difficult to get the aligners off. Today, due to the new attachment design they are much smaller, and this combined with the new aligner material has changed my protocol. Today I put the attachments on with aligner one. It works well. Patients do not seem to have a problem and it eliminates a need for an extra appointment. However, if the case requires buttons and elastics for Class II and III correction I do wait until the 2nd appointment to put the buttons on. For course information on Dr Gray and Dr. Ward’s two day course Utilizing Invisalign to Enhance Restorative Success.